Jean-Luc Andriot and his team were the best decision I made in selling my home! I was selling a home that I had owned for 15 years, and thought where I would spend my retirement years. Life, however, interfered in these plans, and it became clear that I would not be living in South Florida anymore. Jean-Luc did a walk-through of my home, at my request. He suggested the upgrades that were most attractive to perspective buyers and gave the best return on investment. I followed his suggestions, and feel these were exactly what was needed to have a win-win solution with perspective buyers. Jean-Luc also helped set the right pricing for the home, given the market forces at the time of the sale. His services exceeded my expectations, and I am very satisfied with the results. Feel free to contact me should you require more information Cel. : (202) 306-8374. If you are looking to buy or sell a House or Condo, look no further than Jean- Luc. I bought and sold my apartment through him. He has made all aspects a very easy process and explains everything in a very understandable and professional way. I am so fortunate to have your company as a broker. OMG in my purchase, if everything could goes wrong, it went wrong. Jean-Luc is the magic problems solver!!! Jean-Luc you are The Best. If it wouldn’t be Jean-Luc, I would be still looking for my new home. Excellent service in many ways, I felt confident to work with Jean Luc. 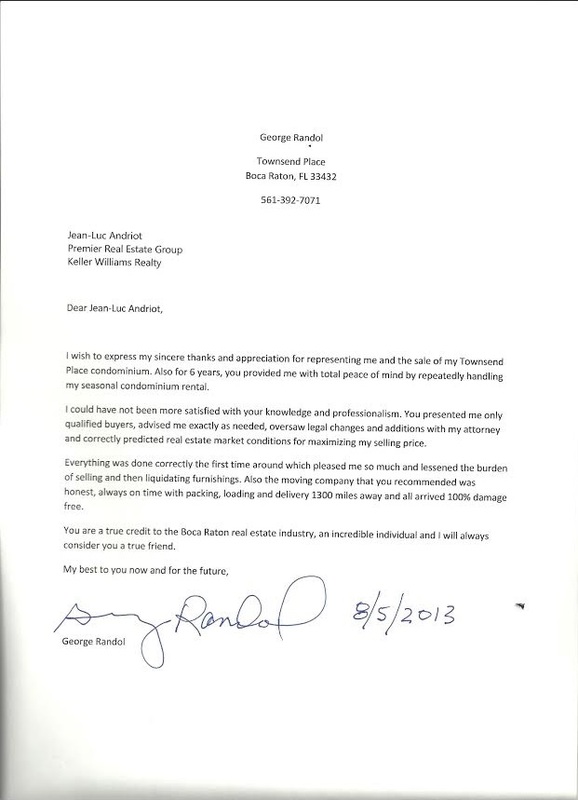 He was diligent in every process and his level of professionalism and care with us was outstanding. We have just sold our property at Townsend Place, Boca Raton. Our realtor, Jean-Luc Andriot at Boca Premier Property Group, provided a first class service, guiding us through the process from start to finish. He, and his team, planned and executed the process impeccably, constantly updating us on progress, and delivering the full price that we agreed at the outset. Based on our experience, we would have no hesitation recommending Jean-Luc Andriot to anyone requiring realtor services. I have had to sell many houses and apartments during the many years of my life, until the mid seventies in Germany, then in the USA and Canada. The last one last week in Boca Raton. I have learned that it is most important, but difficult to find the right real estate agent, one who knows the market, who deals with your problems and, most of all, one you can trust. Jean Luc is such a real estate agent. He kept me informed, brought prospective buyers at convenient times, and sold my apartment…all in a pleasant manner. You cannot find a better real estate agent in Boca Raton, I am grateful to him. I have known Jean-Luc for nearly fifteen years when I had been a resident of Townsend Place in Boca Raton. i had always been impressed by his knowledge of the residential real estate market place. Over the years from time to time casually meeting him in the lobby of Townsend Place where he sold many condos, he kept me fully and accurately informed as to the condo values and real estate market direction. Recently he sold my condo and proved himself to be an excellent marketer who place the condo at it's fair market value and skillfully negotiated the sale of our unit. Quite honestly in all my years in dealing with agents, you by far are the most professional and work the hardest for your clients than I have seen. Jean Luc and his team did such a wonderful job with the sale of my apartment. I am totally satisfied with the outcome but also with the way it was handled right from the beginning. Jean Luc is on top of things at all times, dedicated to the task and more. He has accumulated so much experience over the years and as his client I benefited from his knowledge. He was able to negotiate a better price and an easy transaction. I would certainly work again with Jean Luc either to purchase or sell a home. His has the passion for what he does and attends to his client needs with extreme attention to detail. Put your trust in Jean Luc and his team, you won't regret it! I do not usually give testimonial references but I felt compelled to give this man a well deserved thank you. If there is one person who truly loves what they do, this is Jean-Luc. This is a realtor who really cares about the wants and needs of his clients. He listens, he understands and what I feel is his strongest skill, is his ability to keep the lines of communication flowing in a positive direction between the Seller and the Buyer. I truly believe that we would not have our dream property if we had any other realtor besides Jean-Luc. He is patient, extremely knowledgeable of the real estate market and was always right with his advice. He never made us feel rushed or that we were a burden to call and ask questions continually, whether it was day or night. I will always recommend Jean-Luc and look forward to using his services again when we are ready for another real estate transaction. Jean Luc sold my condo in 2016. He was an exceptionally experienced and organized real estate agent. He arranged showings in a responsible manor and found a buyer for my condo during a difficult period. He is knowledge about real estate law and the Boca Raton community. I did have a good trip back and am now a California Girl ! Thank you for representing me in the sale of my condo. Your counsel, professionalism and communication throughout the process was greatly appreciated. I was impressed by your strategy to get my home sold and more pressed that it sold so quickly at the price you suggested! I am grateful for all that you did to make the entire process hassle-free and feel fortunate to have had you represent me. It was a pleasure working with you for the past year. It was a hard decision for me to fine my next home. But you was always patient and showed me everything that was available...and never forced me to make a choice. You told me the good and bad of each place I looked at..and I did look at so many. And I wanted to sell my house first, which took longer then I expected. But when I was ready to buy, you were there. I would highly recommend you to everyone I know who is interested in buying a home....your a very honest man and you know Boca Raton like the back of you hand. I thank you for helping me find the right home for me. Just wanted to thank you very much for not only selling our condo but making our sale smooth, professional and stress free. You always scheduled showings with our approval of time. We were kept informed of all necessary information and documents. The closing was easy. With your help, experience and knowledge all went well. We recommend you highly. If you are lucky enough to live in Boca Raton, you have the unique opportunity to work with the best realtor on the planet – Jean-Luc Andriot. Face it, buying or selling a house is stressful and represents an extremely expensive transaction. If you don't have the right man representing you, you risk a fortune. Jean-Luc embodies everything good in a business partner. First, his integrity is paramount. Over 15 years and six real-estate transactions, Jean-Luc acted with the highest level of professionalism. Second, he works for you tirelessly; he anticipated problems and helped us overcome the many challenges we encountered. His attention to detail included personal overseeing of the property, especially when it was vacant. Third, he is totally committed to the relationship, not the quick buck. With Jean-Luc, it's never about his commissions; it's always about your satisfaction. Fourth, he knows Boca better than anyone. He has seen every listing and knows each pocket of every neighborhood. He knows the macro trends and the comps, but most importantly he develops a strategy together with his clients. Fifth, his extended network is top shelf. When we needed a litigating attorney to evict our deadbeat tenants, Jean-Luc knew the perfect attorney. When we needed a contract-savvy lawyer, he introduced us to the right firm. Need a great landscaper, trapper, title company, pool maintenance guy – just ask. Sixth, Jean-Luc is hands-on. Unlike other realtor teams who pass you off onto their less-qualified colleagues, when you hire Jean-Luc you get Jean-Luc in person. Other realtors will just put a lockbox on your front door and wait for the contract. Jean-Luc personally attended every possible showing to actually sell our house – what a concept, a realtor that sells the value of the house and the neighborhood! While I would love to have Jean-Luc move to Washington DC so I could hire him again, he is just where he needs to be – serving the good people of Boca Raton and earning one customer at time. Jean Luc and his sales and marketing team has assisted me as an individual and as a developer/builder in the sale of 3 of my properties since 2011. In all instances I benefited with a positive outcome and optimum sales price results. In late 2015 he listed my $1,5M home in the Boca Villas Subdivision in Southeast Boca. Jean Luc or one of his team members were present at all showings. The home sold and closed early 2016 at a price that I believe was for the upper limit of value. Jean Luc, invests his financial resources in on online and electronic email blast marketing, his administrative and marketing staff, advertising and graphic mailings. He provided larger noticeable signage and staffs his open house listings with quality hand out photographic marketing literature. Jean Luc has good listening, communication skills, along with strategic problem solving, valuation and negotiating skills unlike other professionals I have worked with. If happiness is working with a real estate agent who exceeds expectations, then you have made us very happy. As foreigners, buying and selling Florida real estate can be stressful; however, the combination of your experience, proactive assistance, wise counsel and seemingly endless contacts, made the entire process straightforward and hassle free. We were particularly pleased with the speed with which you attended to issues, and the constant flow of information. I would like to tell you of my experience working with Jean- Luc Andriot. The property was my late parents' condo in Boca Raton, FL. and needless to say, a rather sensitive time.In addition, I had listed it with a different realtor who proved less than satisfactory. In great contrast, was meeting with Jean-Luc, a polished, professional and worldly person with strong knowledge of the market and a sensitivity to the people he deals with on a human level. This combined with his motivation to "do the job" to his best ability and deliver optimum results, yielded a positive result very recently, with the sale of the condo! As a bonus, he possesses various language skills ( French, Spanish to name a few) and he and his associates aim to "keep up with the times" from the technological point-of-view aswell. Calls are returned promptly, and every sale matters ...what more could one want? I recently purchased a Condo through Jean-Luc, my experience was so wonderful. He was very professional, knowledgeable and extremely helpful. I highly recommend him. What to say more that for the fifth time, I was using Jean Luc in a real estate transaction (sales and purchases) and for the fifth time, I am fully satisfied! And for this last transaction what really pleased me is that he got my expectations in term of price, when he smartly rejected other lower offers. For sure next time, I will need a realtor, I will call 561-213-9008. We deeply appreciate all the work that you carried out for us to finally have our new home in Florida. From the day we met You were distinguished for your professionalism and warmth, always smiling and ready to work. We did feel that we were with a friend helping us to find the most convenient property. You even worked on week end, always polite without pressuring. During the paperwork process your knowledge and skills were invaluable because at all times you knew what to do and how to anticipate every step of the way. Definitely your collaboration was essential to ensure that everything was carried out properly. The closing day we really felt that we were sharing the joy with a great friend. We really appreciate your patience, your work, your smile, your professionalism and human quality. We had the pleasure and privilege to work with Jean-Luc many years, his deep knowledge of the South Florida real estate market is invaluable, his integrity and smart negotiating skills and detailed support in the paper work as well as his professionalism and service without compromise is highly appreciated by us. Jean-Luc assisted us in the purchase and sale of three properties in Townsend Place and it was all ‘smooth sailing’. Whoever wants to buy property in South Florida Jean-Luc is the man, we highly recommend him without hesitation. We enjoyed his company and work style and we wish him continued success. During the ten years I owned at Townsend Place, I grew to know you well and appreciate all your hard work. To me, you are definitely "Mr. Townsend Place." I am happy to recommend you highly to all prospective new clients, and wish you many years of continued success. I found working with Jean-Luc to be an absolute pleasure. Moving my Mom into a rental unit proved to be a lot easier with his easy and accommodating manner. If you are looking for a rental or a home.... I believe Jean-Luc is the man for you! Jean Luc Andriot is the go to person at Townsend place...he sells more real estate in that bldg then anyone else! I have had the pleasure of working with Jean-Luc and his associates. It was a very good and honest experience. I live in Boca Raton, Townsend Place. Jean-Luc is one of the most knowledgeable Brokers in South Florida. Coming from Boston I found Florida a much different real estate market, with a lot of real estate brokers, to choose from. I would Highly recommend, his services and knowledge to anyone, Buying or selling real estate in this Market. My wife and I found ourselves wanting to sell a rental house we owned in Delray Beach. Laura found Jean-Luc and told me what a gentleman he was and that she thought we should choose him. I know lots of agents in the Delray Beach area from being in the business and networking and it was going to be a hard choice because I like them all and they all seem to be very conscientious. I just decided to go along with Laura and try Jean-Luc. Well we didn't get just Jean-Luc, we got his great assistant Max too. It couldn't have been any easier getting the documents arranged and executed. Our tenant situation didn't make for a very good showing situation and Jean-Luc diplomatically related to us the hard news. He worked with Laura to overcome the problems. Over and over he and Max went beyond the duties I would have expected of he and Max. Without going into all the details, after the closing I asked Laura to be sure and tell Jean-Luc and Max I love them! They are great individuals first and foremost and great agents on top of that. I wanted to thank you for all you work and effort you put into the sale of our unit. With the knowledge and information you have on Townsend Place I feel that without you we would never have achieved the sale price you brought us. Also with your help we look forward to buying another property in the Boca area. After working with you it is very clear that your have a passion to provide 1st class service from listing to closing and beyond. I have been in real estate for 36 years and very few agents have the drive you have shown. ... I want to thank you and Max for all of the help you gave me while we were trying to sell my parents condo in the Townsend Place Condominiums. In July of 2011 when we committed to beginning the sale process, the two of you were amazing; answering all of my questions, available on the phone day and night, and giving me incredible advice. While all of the decisions were mine, your counsel along with all of the information you continually provided me, gave me what I needed to make intelligent decisions. While I have not been involved in the real estate business for years, you and Max took the panic away. I couldn’t have asked for a better counselor or tour guide during the time we worked to sell the condo. If I can ever be of assistance to you or provide another possible client with a reference, please feel free to contact me. You have my number. Wishing you and your family a great rest of the year. My wife and I would like to thank you for your hard work and professionalism with regards to our short sale at the Meridian in Boca Raton, FL. At first I must admit, it was frightening, after all the horror stories we heard about short sales and the lack of communication between sellers and Lenders. I must say your persistence and professionalism surpassed our expectations and the results speak for itself. As you know, I was a Real Estate developer in Michigan, and have had experience with many sales, but never have I seen a sale and closing go so smoothly. In closing we would like you to know in the future, my family and friends will turn to you for their Real Estate needs in South Florida. Happy New Year to you and your staff.